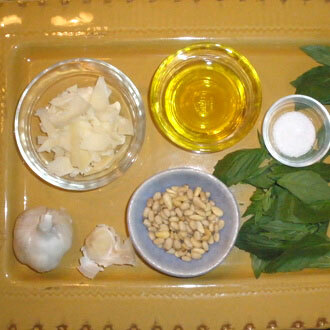 Chop garlic, salt, and pine nuts in a blender or food processor until finely chopped. Add basil and olive oil; puree until smooth. Add the cheese and process just to combine; taste and adjust seasonings. Serve with pasta or grilled meats or vegetables. Vary this recipe by using The Olive Oil Source Basil Natural Flavor Infused Olive Oil.